Do you need to open up a dark kitchen or bath? Or perhaps you want the beauty of an open sky to be part of your design plans. Well, a skylight is a perfect choice for you. Skylights are great ways to turn even the darkest rooms and turn them bright and sunny. Especially with winter creeping on us, having that extra light will brighten even the snowiest of winter days. Are you still not convinced? Here are a few reasons to add a skylight to your home. Skylights are an excellent natural source of light and a great alternative to electricity. With natural light, you can cut down on energy use and utility bills. Using daylight also reduces the demand for unsustainable power, promoting an environmentally-friendly lifestyle. Sunlight is an unlimited resource. solar energy does not produce harmful emissions or require transportation or pipelines like electricity does. So turn off your lights and let the sun do the work of lighting your home! There is nothing that compares to the quality of natural light. By age 60, most people need two times more light indoor. Natural sunlight is a free and available mood enhancer. It encourages Vitamin D and protects us from seasonal mood changes. Poor or insufficient light can cause eye fatigue, headaches, trigger depression and can have a negative effect on our immune system. Light is also great for focus! Bright lighting stimulates the mind while dim lights quiet our senses and make us feel drowsy. Skylights allow you to improve the natural light in your house by reducing glare and transforming areas into more open spaces. This increased sunlight stimulates a faster recovery from illness and helps reduce blood pressure. With skylights, you reduce your dependence on electric power, thus reducing utility bills. You may also qualify for tax deductions by incorporating alternative sources of energy and equipping your house to be eco-friendly. In addition to reducing lighting costs and energy consumption, skylights also minimize the need for air conditioners and fans during the warmer months by increasing ventilation. Opening your skylight draws fresh air into your house, providing a healthy and more comfortable living environment. This causes a passive air conditioning process, where warm air comes in through a ventilating space to create balance and improve air quality. The warm air is drawn up through the venting skylight, providing a cooling effect and fresh air throughout the house. It is important to know where you want to put your skylight. Base this on both your inside and outside aesthetics. You also need to know where you have an attic and where you don’t. 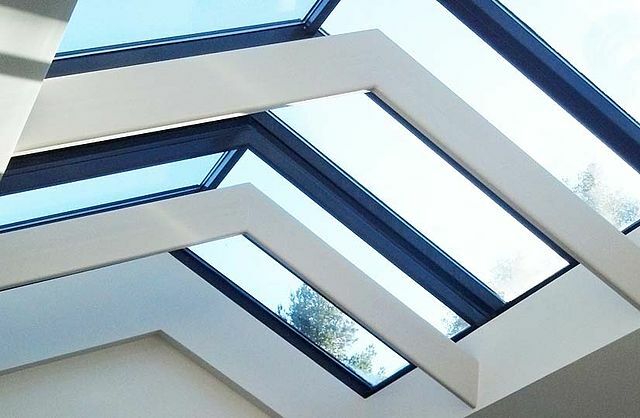 If you need to open up your skylight, place it somewhere that you can manually open it up easy, or consider putting inaccessible controls to open up your skylights. There is also direction. If your skylight faces east, then you will get warmth and light in the morning. Facing west and you’ll get those benefits in the afternoon. If you want a constant, but cool illumination, face north, but if you want to maximize heat gain during the winter, face south. So you’ve decided to get a skylight? Great! Extend the life of your roof and skylight with proper installation, inspection, maintenance, and repair. Trust the professionals at Titan’s Roofing. Let us carry the weight. Call today for a free estimate.